What is Your Secret Stuff? How can it bring you more happiness and abundance? 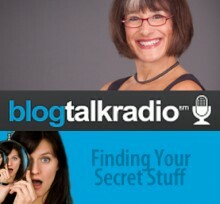 Hear Cindy speak on September 17 at 4pm in her ongoing radio series on BlogRadio with Zurriane. Do you want to live a happier life? Do you want to see your business soar to new heights? All the answers can be found in your Secret Stuff. In the 30 minutes of Zurriane’s show, I will touch on three reasons why you need to come to The Secret Stuff workshop series beginning in January 2014. It will transform your life! through the RSS 2.0 feed. 12 10 10: Life is a Team Sport.